As much as we’ve grown accustomed to tripping over power strips in every corner of our homes, we’re thinking it’s time for a change. Change how you power your devices when you get Kinkoo’s 6-port high-speed charger for $35, a savings of 29%. Just four inches high, the Kinkoo stays out of the way on your desk while you charge six USB-compatible devices at the same time. It even recognizes the devices you plug in, optimizing each port so that you get the fastest possible chargeâ€”85% faster than conventional chargers, to be specific. Great things really do come in small packages. 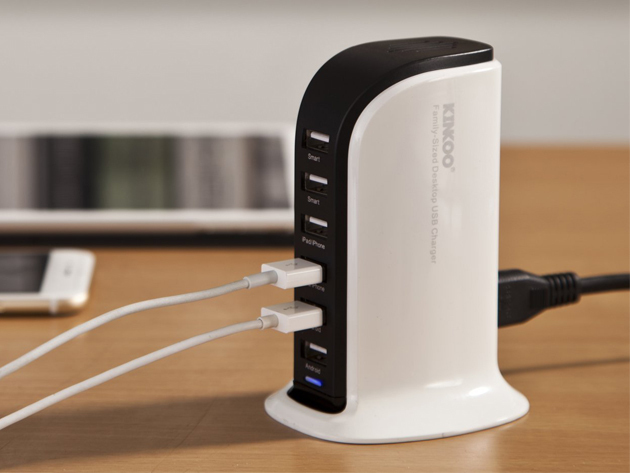 Get the Kinkoo 6-port high-speed charger for $35.